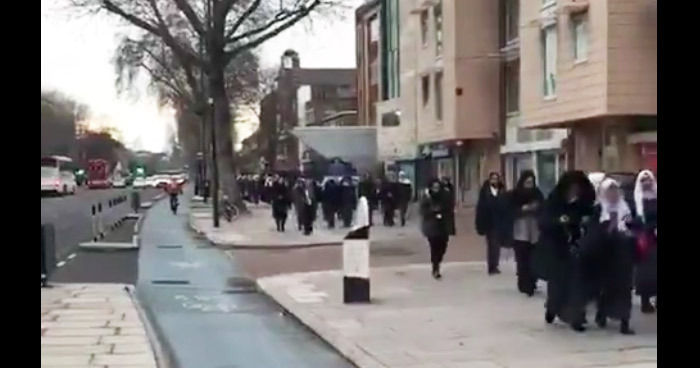 A white man in his 60s has been arrested in East London after a video he made threatening Muslim schoolgirls went viral on social media. He is alleged to have followed a group of Muslim girls and hurled racist abuse at them too. In the video he is heard hurling abuse at schoolgirls, calling them "f**ing c*nts" and saying their ovaries should be 'burned out’ so they can’t have children. The school girls were thought to be filmed outside Central Foundation Girls School, in Bow, east London. The video is reported to have been taken last week. Here is an excerpt from the video, posted to social media. Warning: it contains violent and aggressive language. The video had been condemned by the Tower Hamlets mayor, John Biggs, and local councillors. The Metropolitan Police initially made an appeal for information about the video. They have now confirmed they took a man into custody in relation to the video. He has not been named yet.